The perfect gift for Band fans: 40th anniversary edition of Elliott Landy's Woodstock Vision, signed by the legendary photographer! Elliott Landy at the Woodstock festival '69. Photo © Amalie Rothschild. Elliott Landy was the Band's official photographer in the '60s and early '70s. His classic cover photos for the Band's first two albums, Music from Big Pink and The Band, wonderfully captures the feeling of community, mysticism, and roots that were present in the music and the stories told by the Band. He worked with the Band again in the '90s, taking the group photos for their 1993 album Jericho. 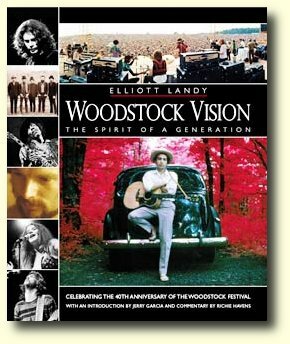 In 1996 Landy released a CD-ROM titled Woodstock Vision - The Spirit of A Generation, with original music by Garth Hudson. Included with this CD-ROM is a second printing of Elliott Landy's book Woodstock Vision - The Spirit of a Generation. Top quality versions of the photos below, and many more, can be found in the highly recommended book and CD-ROM, available from the LandyVision web site. Fine art lithographic reproductions of the famous Band portraits from Big Pink and The Band are available for purchase. Elliott's artwork can be ordered from his LandyVision web site, where you'll also find web-gallerys with more photos of The Band and other artists. All the photos below are copyrighted. You are not allowed to use or redistribute any of these photos without permission from Elliott Landy. B/w photos from the book Dylan in Woodstock.